Prior to this season, the Federal Reserve delivered a ranking of the top-10 prospects for the Washington Nationals. With the minor league campaign now past its halfway point, I’m revisiting the list to update the statuses of each player. The original top-10 was delivered in two parts; you can view prospects 10 through six here, and five through one here. For the purposes of readability, I’m leaving the players listed as they were originally ranked, though the reports will provide some insight into their stocks at this time. Giolito’s much-anticipated debut came in late June, and he performed admirably over a two-start call up. Now at Triple-A Syracuse, Giolito will continue to iron out his improving change up and look to return to Washington later this year. 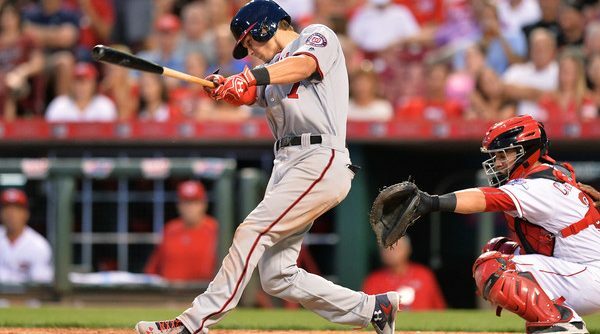 The sudden surge of Danny Espinosa has kept Turner from becoming Washington’s full-time shortstop, but Turner has looked capable in centerfield in the short time since transitioning. For the remainder of this year, Turner’s best shot to receive semi-regular playing time in the majors may come in a super utility role, but his stock as a prospect remains high. Robles has surpassed his hype this season, cruising through Low-A Hagerstown before moving up a level to High-A Potomac. He has a fairly advanced approach for his age, and has the makings of a centerfielder who should play excellent defense while showing solid contact skills and above average power. Robles, who could hit anywhere from first to third in the majors, may very well be the organization’s best prospect before next season. Any concerns about Lopez’s ability to pitch a major league rotation are being subsided by his excellent work this year. While continuing to develop his fastball and curveball combination, Lopez has finally turned the corner with his change up, which is emerging as a formidable third pitch. He has progressed so far that the Nationals chose to call him up for his major league debut as a starter this Tuesday. In his first full season, Fedde got off to a shaky start at Potomac before missing a few starts in June due to injury. He has looked sharper since returning, and has managed to maintain solid strikeout numbers throughout the season. Fedde’s change up is still a work in progress, but if it develops enough to form a solid trio of offerings with his fastball and slider, he should be a middle-to-top-of-the-rotation candidate. Difo got off to an incredibly slow start at Double-A Harrisburg, but he has caught fire of late. 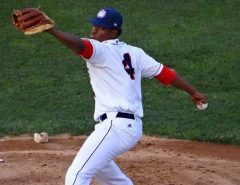 Some of Difo’s issues likely stemmed from a broken left hand he suffered last September, and after some time, he has shaken off those problems. Given the Nationals’ influx of middle infield options, the team probably doesn’t have room for Difo in the majors, but he remains a name to watch. To this point, Cole has been uncharacteristically inconsistent at Syracuse. Some doubts have lingered about his ability to generate enough secondary offerings to be much more than a back-of-the-rotation starter. Perhaps, as he did last year, Cole will iron out his issues over the final two months and get back on track. Undoubtedly he has been surpassed by other prospects in the system, but it is worth remembering that he is still just 24. Voth continues to get by with his command, as the formula that has allowed him to be successful in previous stops is working at Syracuse. While it is typically thrown in the thrown in the low-90’s, his fastball alwats properly located and Voth has continued to refine his change up and curveball combination. At this rate, it would not be surprising to see him make his major league debut this season. Stevenson has looked good in his first season, showing solid contact skills—thanks in part to an improving swing—while continuing to play good defense. Following a promotion from Potomac, he has gotten off to a slow start at Harrisburg, but should improve with repetition. Following a solid 2015, the teenaged Franco looked prime for a breakout this season, but he has yet to see any action because of a back injury. Franco projects to develop into a solid power hitter. 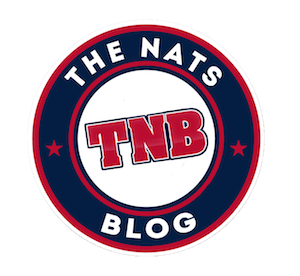 Given his size, many wonder if he will stick at third base, but the Nationals have expressed a willingness to let him develop at the position. If he returns this season, Franco will likely see action at short-season Auburn.